The focus on cross-cultural communication, a particular interest of mine. Whishaw is just fine, as always, as is the rest of the cast. And the cross-cultural communication is reasonably realistically portrayed, if rather stagy. But this turns out to be one of the film’s biggest flaws. 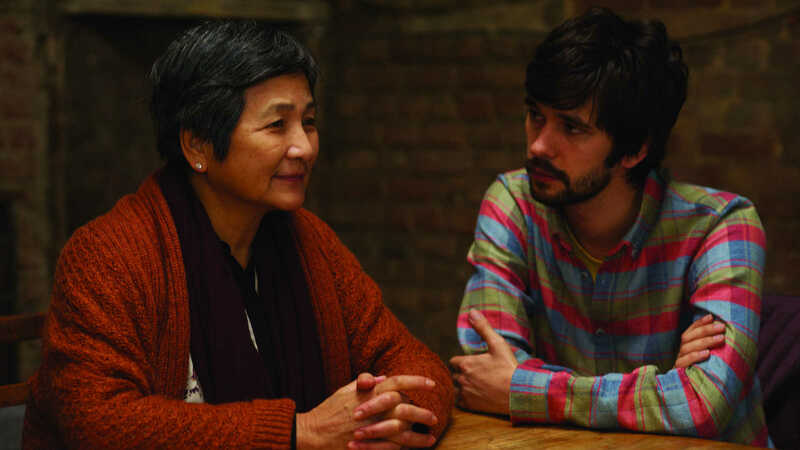 The vast majority of its runtime is taken up by scenes involving Whishaw’s character, the prickly mother of his deceased partner (Pei-Pei Cheng), and a Mandarin-English interpreter (Naomi Christie), meaning we get each line of dialogue twice: once in English, once in Mandarin. These conversations-by-proxy may be realistic, but they aren’t particularly thrilling or dramatic, nor do they illuminate much about the characters’ struggle to connect. The differences between Whishaw and Cheng are immediately apparent — progressive, young, gay British man, and traditional, old, straight Chinese-Cambodian woman — and the way those differences are overcome ultimately has little to do with spoken language. More than anything else, the three-way dialogue scenes make for a film that’s at least one-and-a-half times longer than it needed to be. Apart from all that, I was left with way more questions than answers. Not questions of philosophical import about the nature of communucation, as I’d hoped for, but vexing questions about the plot: what does Whishaw’s character do for a living, given that he’s able to live in that massive flat but we never see him work? Why does he want Cheng to stay romantically involved with a fellow retirement home resident? Suddenly, he and the interpreter — a woman — seem very close; how and when did that happen? Khaou’s frustrating tendency in LILTING is to linger way too long on scenes of little consequence, then skim over the moments that actually catch the attention. He even turns up the score — the cloying, manipulative, ‘feel something you dicks’ score — to the point that it obscures what may have been some of the most tantalising pieces of dialogue, if we’d been able to hear them. It’s ironic that a film about overcoming the limits of our communicative abilities is itself spoiled by an over-reliance on withholding information from the audience.